The beginning of the Paul Bunyan Trail is Segment 1. Mile markers 0.0 to 14.3 cover areas from Brainerd, Baxter, Merrifield, to just north of Nisswa. Paul BunyanTrail can be found here. With a 2013 population of 13,487, Brainerd MN is one of the largest cities in Central Minnesota. It is the core of an ever expanding service center for area residents and the rapidly growing tourist economy. In addition to being identified as the major commercial hub and the county seat for Crow Wing County, Brainerd’s service role includes a large number of other governmental facilities, a major hospital, scheduled air and rail services, a technical college, and a community college. City government provides a full range of services, including an extensive outdoor recreational system. Travel accommodations may be found in 23 motels with a total of 702 rooms or units. With a population of 7,781, Baxter ranks as the trail region’s third largest city. As Brainerd’s western neighbor, Baxter MN is a major partner in a rapidly growing urban complex. While its residential areas are primarily suburban in character, the city contains a number of attractive lakes and many acres of natural landscape. The Mississippi River forms Baxter’s southern boundary. Mile 0.0 A major trail access/parking lot and rest area. Interim parking is located northeast of the trail on Excelsior Road. Approximately 40 spaces and an Information board are located here. Mile 3.5 This rest area should be large enough to accommodate groups, and should include a shelter, rest room picnic tables, fire ring, and an information board. Mile 5.5 Rest area/wetland overlook. 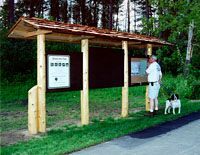 This small rest area would include a pull off, benches, and an interpretive sign.